The clocks have already gone back, but even by then it was already getting darker by day’s end, so thinking about lights for your bike is already an imperative for sensible cyclists. Sharing the road in dim or dark conditions means that having the right lights on your bike can mean the difference between safe riding and simply perilous peddling. For many, the bewildering array of choice can be more hindrance than help, so one of the first steps in making your choice of appropriate lights will be to consider the purpose of your bike lights when you are caught in the dark ¬– do you want to see, or do you want to be seen? 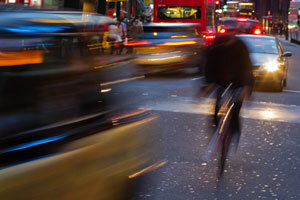 For personal safety, the latter is the well-accepted and foremost role of bike lights. For the majority of cyclists, the primary reason for lights is not to enable them to see in the night, but rather to make them much more visible to cars and other road users. Off-road adventurers of course will need to see their surroundings in order to avoid obstacles and know where they are going, so a more heavy-duty lighting option that will light up the path ahead will be needed. These regulations are consistent across Australia, but the penalties for breaching them vary from state to state, and range from $25 in the Northern Territory to around $150 in Victoria. On urban streets, a lot of the time it will be likely that riders will take roads or paths with streetlights. So while cyclists will probably be able to see adequately to ride, other road users will generally be unable to see them — so the imperative here is to stand out from the dark surroundings. Choice of light should also consider side vision as well as front- or rear-on visibility. Flashing lights are an obvious distinctive element that sets bike lights apart from motor vehicle lights. However the more traffic, the better those lights should be. It can also be the case that some of the journey will be along roads mostly with street lighting but with sections that are darker, depending on your usual route, so a combination of flashing light plus a steady headlamp may be called for. 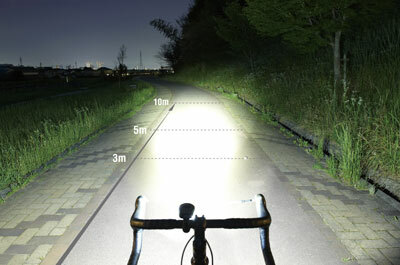 On regional roads or in areas with poorly-lit streets or bike paths, a bright headlight will of course be required to illuminate the road ahead, so this scenario becomes a see-and-be-seen consideration. But more urban riders may still consider a torch-like bike light, as these can be very handy if, for example, a puncture needs to be fixed on your way home in the dark — and in these situations a rider will be thankful for a detachable light. Off-road riders will of course require brighter, better, and more robust lighting solutions. A wider beam will bring the bush on either side into sight, and lighting in front should beam far enough ahead to give the rider time to react. By the same token, rear illumination (if in a group of riders) needs to be adequate enough to give anyone behind time to take evasive manoeuvres. Robustness will be an obvious sought-after quality for off-road uses, but any cyclist who rides every day, come what may, should assume that their lights are going to take a beating. Riders may need to consider durability and weatherproofing (including any seals), and don’t forget UV resistance (if this is ascertainable). It’s not always the case, but generally the more expensive options will have all this sorted. Also check what the warranty is like. A final consideration has to do with convenience and personal habits when cycling — are you going to be taking your lights off your bike on a regular basis, or leave them attached? Your choice of light may be influenced by your answer, as the simple fact is that some bike lights are a breeze to steal. If they are going to be on-and-off your bike every time you hit the road, you will of course look for lights that are easy to detach (although opinions are divided about whether habitual removing and re-attaching actually leads to more sets of lights going missing from bags or bedrooms than are stolen). Permanently mounted lights are one answer, as they are harder to get off. Then again, if you have more than one bike and enjoy riding each one, so that a lot of swapping of lights between bikes is likely, mounts that are quicker to release will be more for you (and you’ll probably prefer no wiring to deal with). And if you think super-cheap lights that you don’t care much about are the answer, think again — apart from mounting mechanisms that are more likely to fail, dirt cheap lights often end up as bits of shattered plastic on the now-darkened road behind you. There are basically three main choices in light-producing technology when it comes to the majority of cycling lights — LED (light emitting diode), halogen, or HID (high intensity discharge). The ubiquitous LED light bulb dominates the transport lighting world, although LEDs are not actually bulbs at all but very small semi-conductors — you’ll even find some in your alarm clock or TV remote. They are inexpensive to manufacture, produce little if any heat, and can be housed in smaller and therefore lighter-weight packages. Clustering several LEDs or focusing them with good lenses increases the amount of light that can be produced. Halogen bulbs set the standard for brightness for many years, and they are used in the home as downlights. They are cheap, rugged and the circuits are very simple, making them easy to repair. They produce quite a lot of light, but the main draw back is a lack of efficiency — meaning that quite a bit of heat is produced as a by-product of the light, and consequently they will eat up a battery’s charge quickly. Halogen bulb lifespan has been calculated at around 8,000 hours. HID was originally developed for the medical field, but was soon adapted for other uses such as for motor vehicles and scuba diving. HID bulbs produce more light than any of the above, and so will suit off-roaders, but they generally cost more. Plus, the lifespan of an HID is only about 1,500 hours, compared with the approximately 50,000-hour lifetime of an LED. The power source for each of the above options tends to be dictated by the particular light’s manufacturer, as the types of bulb utilised will obviously need an appropriate power source (although the innovative handy types among us may have the know-how to re-engineer off-the-shelf offerings). But the common choices are: Batteries (throwaway or re-chargeable); external battery pack (generally for the high-powered lights, connected with a cable); or self-charging systems such as dynamos. For the first two power choices, recharging systems are increasingly being offered with USB plugs as well as mains power wall chargers. This is a great option for many commuters and allows you to juice up your lights for the ride home while at the desk. Dynamos have come a long way since the high-drag “bottle” dynamos of years ago, and can now be incorporated with the hub or bottom bracket, and there are even electromagnetic induction systems which require no contact at all, and so have zilch drag. Most should have some reserve power for limited lighting when stationary for a short period, like when you’re waiting for traffic lights to change. There are also alternatives that may take your fancy. The LightLane laser light system projects two bright laser lines onto the road surface, with the universal symbol for “cyclist” in the middle of them. The idea is that the laser light creates a virtual bike lane of light that moves with your bike, and gives cars the impression of a dedicated road space assigned to bicycles. A similar product is the Blaze laser device (see AC, Sept-Oct 2011, pg 15), which projects a bright green image of the “cyclist” traffic symbol on to the road surface ahead of the bicycle. Reelights are day and night running lights, powered by magnetic induction current generation by way of magnets that are fitted to the bicycle’s spokes. As the wheels turn, electric current is produced every time the magnets pass over a light diode and the bulb flashes into life (light unit and diode are fixed to axle ends). There is no contact between magnets and diode, hence zero drag, and means the lights can stay on all the time. There are also options for limited stored current for lighting while stationary. Prices range for $50 to $100, depending on model, and weight ranges from 200gms to 320gms. Revolights is a bike lighting system that consists of two narrow rings of LEDs that mount directly to each wheel using a series of rim clips. Bracket-mounted batteries at each hub (slim, and charged via USB) supply the power, and a fork-mounted magnet and accelerometer provides speed and orientation data to the LEDs so that they only light up the arc of the leading one-third of the front wheel in white and the trailing one-third of the rear wheel in red (best explained visually, so try the Revolights website for a demo video). The Revolights system is not yet available in Australia, but the US designers say it should launch in the US in late June and retail for about $US220. Availability to the rest of the world is yet to be finalised. The designers say weight is expected to be around 400gms. Choosing bicycle lights is not just about cost or brightness, but also brings in considerations about time and convenience, weight and size, and the ongoing costs of your choice. Rarely is one light choice the complete answer, and many cyclists will feel drawn to a “belt-and-braces” solution, and for example carry a steady beam light combined with a small flasher, or even more. Each cyclist will have different priorities, although most will have an overriding priority — to stay safe, to see and/or be seen.